Check out full results from the 2012 Duel-athlon SUP Race at the Surftech Shootout. 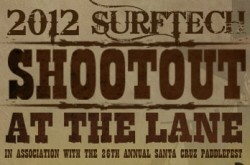 The race was held on Saturday 17th March at the famous Steamer Lane, Santa Cruz. Californian guns Candice Appleby and Anthony Vela took out big wins. Scroll down for race results and check back real soon for photos and video of the action. Pics and video of the race action coming soon. Big thanks to Surftech for getting the results online so quick!